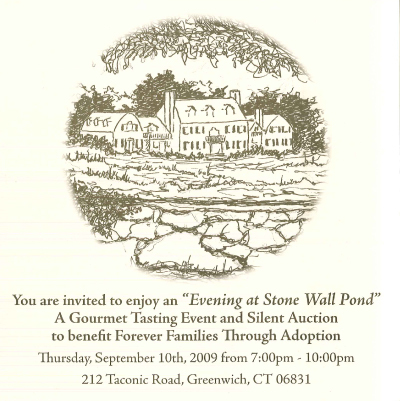 You are invited to join an " Evening at Stone Wall Pond". Forever Families Through Adoption, Inc,( FFTA) is a New York and Connecticut authorized, not-for-profit, adoption placement agency and resource center founded and staffed by social workers, attorneys, adoptees, and adoptive parents. We believe that every child eligible for permanent, adoption, regardless of racial or ethnic background, age, or physical or emotional challenge, has the right to grow up in a loving, nurturing, secure, and forever home.